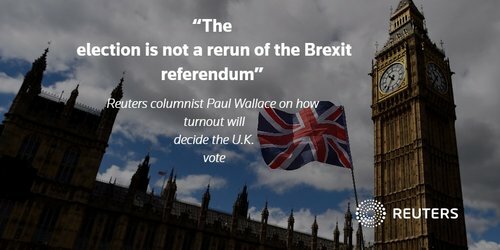 Reuters UKThe lead of Prime Minister Theresa May's Conservative Party over the Labour Party has narrowed to 10 percentage points but she is still on course to increase her parliamentary majority, according to a ComRes poll conducted for the Independent newspaper on Wednesday, a day before Britain's election. 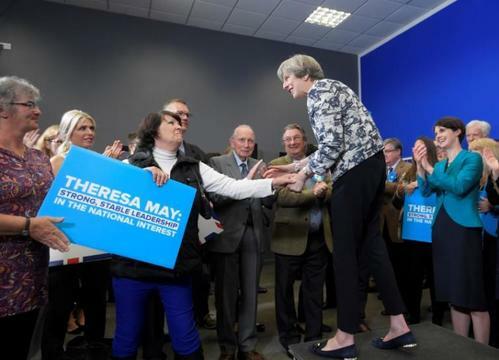 Prime Minister Theresa May faces the voters on Thursday in an election she called to strengthen her hand in looming Brexit talks, with her personal authority at stake after a campaign that saw her lead in opinion polls contract. 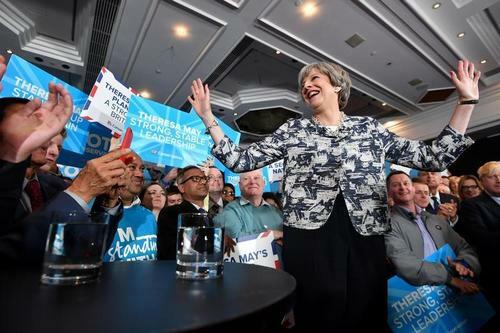 Reuters UKThe lead of Prime Minister Theresa May's Conservative Party over the opposition Labour Party has widened to seven percentage points in a YouGov poll, The Times newspaper said on Wednesday, one day before Britain's national election. 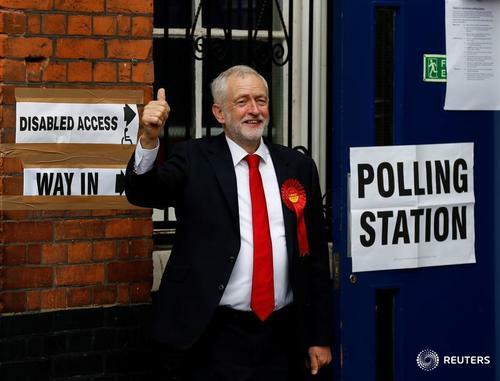 Reuters UKThe lead of British Prime Minister Theresa May's Conservative Party over the opposition Labour Party has remained at one percentage point, according to a Survation poll published on Wednesday, one day before Britain's national election. 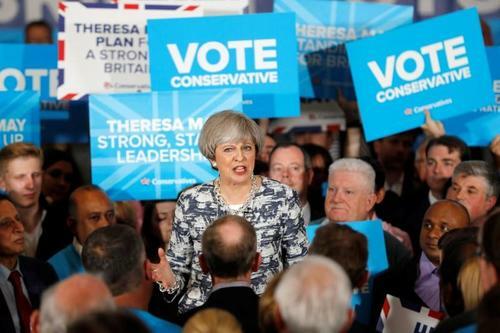 Reuters UKThe lead of British Prime Minister Theresa May's Conservative Party over the opposition Labour Party has halved to five percentage points, according to a Kantar poll published on Wednesday, one day before Britain's national election. 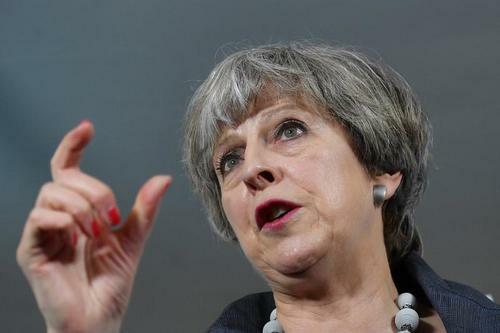 Reuters UKThe lead of British Prime Minister Theresa May's Conservative Party over the opposition Labour Party has remained stable at eight percentage points, according to a Panelbase poll published on Wednesday, a day before Britain's national election. 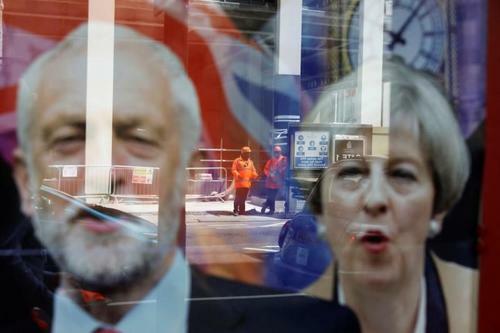 Reuters UKPossibly the two most intriguing unknowns in the UK election as voters head to the polls today are how successful Theresa May will be in scooping up UKIP voters in former Labour Party bastions, and how many young voters will actually turn out to vote for Jeremy Corbyn. 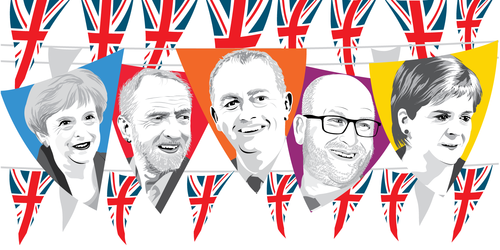 What are the possible outcomes for today's general election? Read our explainer. 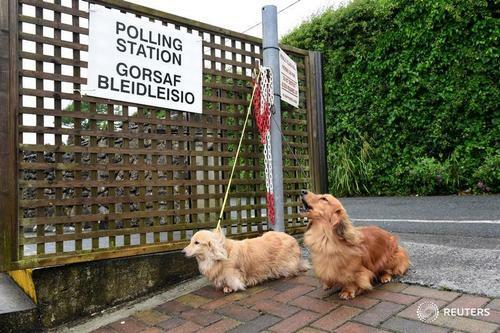 All the best dogs at polling stations ???????? 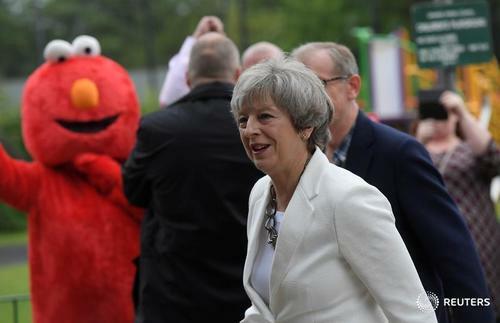 Theresa May arrives with her husband Philip to vote in Sonning, accompanied by her husband Philip and watched over by Elmo of Sesame St.
Reuters UKMarket bets on how volatile the pound will be over the next 24 hours surged to their highest in a year on Thursday as Britain began voting in a parliamentary election which some polls show has become too close to call. 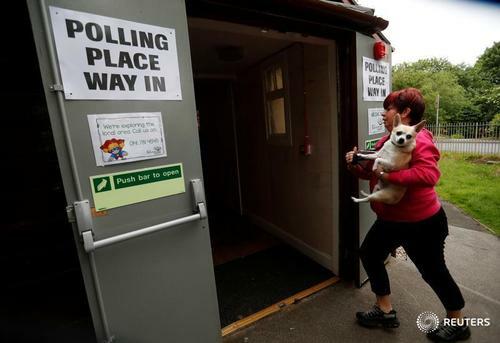 Reuters UKBritish shares marked time on Thursday as Britons headed to the polls after a tumultuous campaign which saw Prime Minister Theresa May's lead tighten in recent weeks. 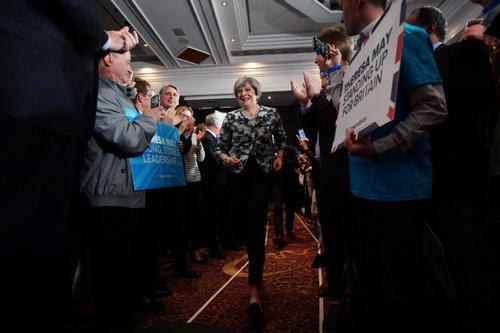 Reuters UKA final opinion poll published on Thursday as Britons vote in a national election showed Prime Minister Theresa May's Conservatives widening their lead to 8 percentage points from a 5 point lead in its previous survey. 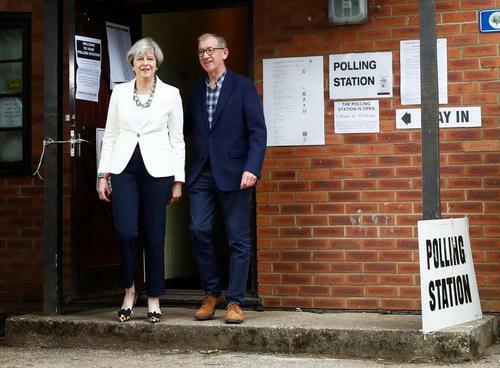 Reuters UKBritons began voting on Thursday in a snap election predicted to give Prime Minister Theresa May a larger parliamentary majority, which she hopes will strengthen her hand in looming divorce talks with the European Union. 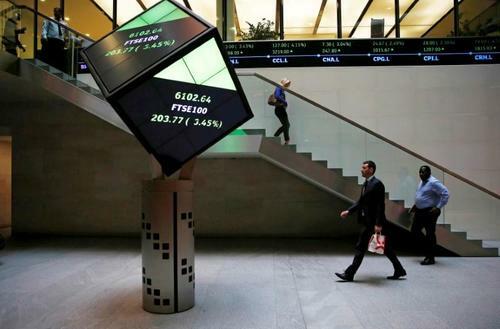 Reuters UKThe UK's top share index dropped to a three-week low on Thursday as Britons headed to the polls after a tumultuous campaign which saw Prime Minister Theresa May's lead tighten in recent weeks. 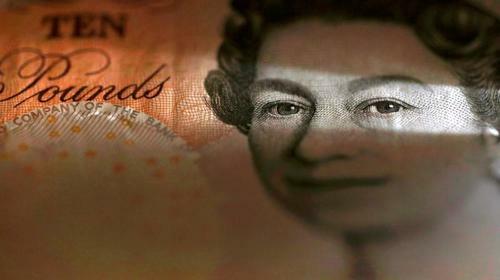 Reuters UKSterling slipped against the dollar on Thursday while market bets on how volatile the currency will be over the next 24 hours touched their highest in a year, as Britain voted in a national election that some polls have suggested is too close to call. 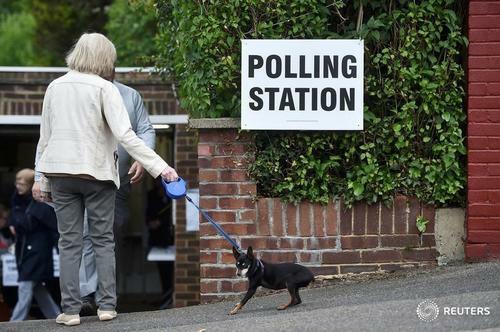 A British tradition on polling day. 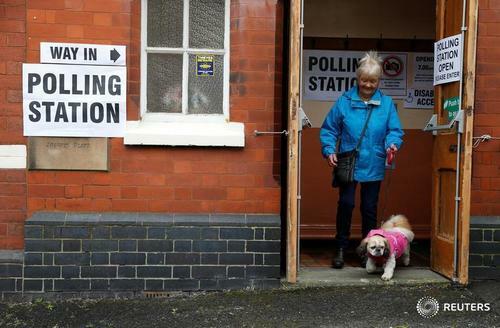 A 'paw's while people vote and our canine friends get a visit to the polling station. 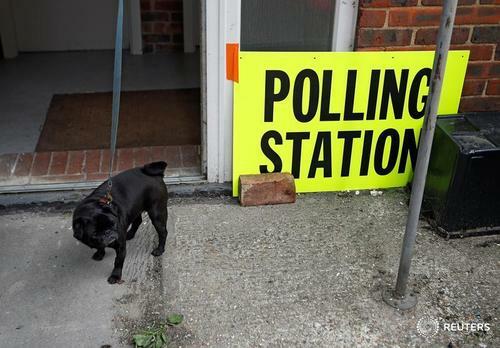 #DogsAtPollingStations Check the slideshow as we update it through the day. 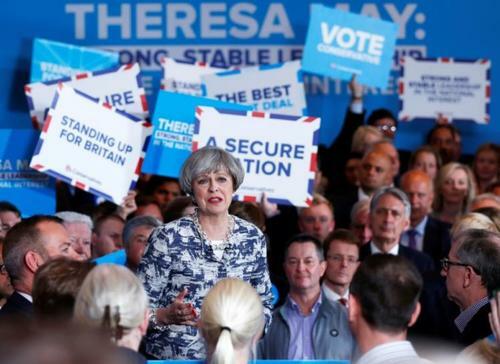 Reuters UKBritish Prime Minister Theresa May's narrowing lead in opinion polls ahead of the June 8 election has weakened sterling and raised questions over whether she will win the landslide predicted just over a month ago. 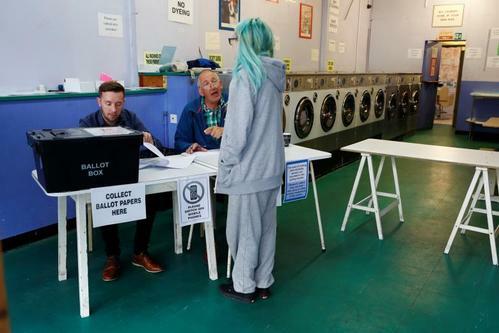 When voting closes at 2100 GMT, an exit poll will be published simultaneously by BBC, ITV and Sky. 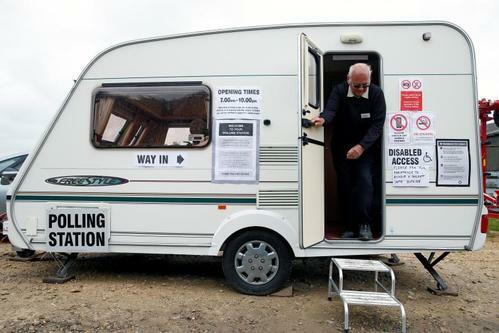 It is conducted by pollsters GfK and Ipsos MORI, who will speak to thousands of voters at more than 140 polling stations around the county. In 2005 and 2010 the exit poll accurately forecast the number of seats won by the largest party. In 2015 it slightly underestimated the number of seats won by the victorious Conservatives, but got the order of the parties right. Due to be the first result of the night. It was one of the first big Leave-voting areas to declare in last year's referendum on European Union membership, shocking markets by backing Brexit more strongly than expected. It is held by the opposition Labour Party, with a majority of nearly 13,000 votes, but will be closely watched for the fortunes of the anti-EU UK Independence Party (UKIP), which came second here in 2015 with more than 8,000 votes. UKIP's poll share has collapsed since 2015, and this seat could give an indication of how far May's Conservatives are succeeding in mopping up former UKIP supporters. Considered a national bellwether seat, Nuneaton could provide an early clue of the possible swing between May's Conservatives and Labour. The Conservatives increased their majority here in 2015, despite it being a Labour target, and it provided one of the first indications the Conservatives were on course for victory. 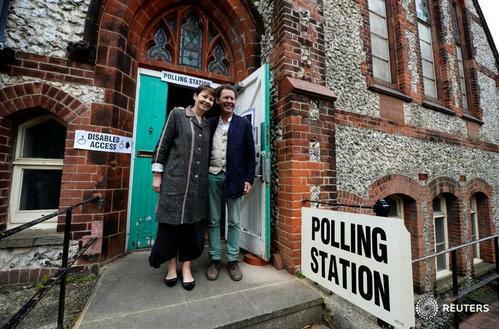 This Conservative target seat, which voted in favour of leaving the EU, is held by Labour with a majority of 3,158. 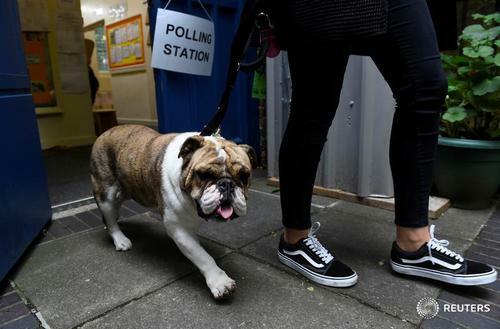 A YouGov regional poll last month showed support for Conservatives had risen significantly in the northeast of England, and the Tees Valley region, in which Darlington sits, unexpectedly elected a Conservative mayor last month. 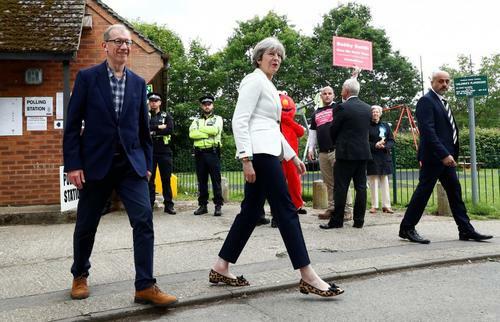 A win for May's party here could mean she is on track for a landslide nationally, according to polling expert John Curtice. 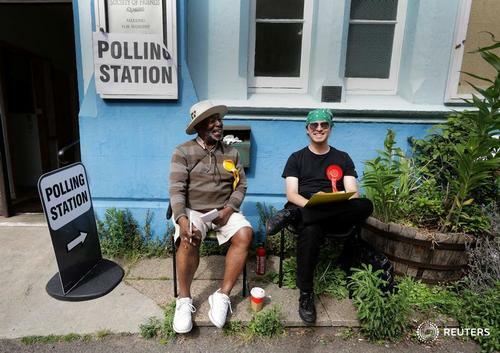 This seat has elected a lawmaker from the winning party at every British national election since it was created in 1974. It is held by the Conservatives with a majority of 3,245. UKIP, which won more than 6,000 votes here in 2015, are not fielding a candidate so it should be a comfortable win for the Conservatives if they are to increase their national majority. 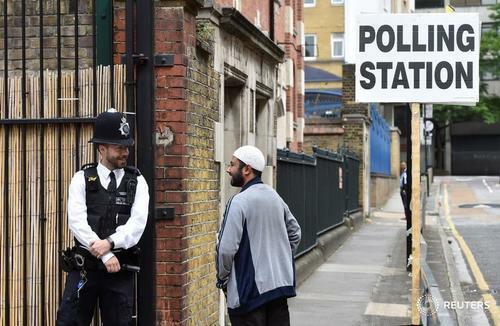 This is a Conservative-held marginal seat, with a majority of just 378 voters. It has been a bellwether seat so if the Conservatives lose it, despite facing no UKIP candidate, it could be a sign they are at risk of losing their majority. The seat of the pro-independence Scottish National Party's leader in Westminster, Angus Robertson, who won it with a majority of just over 9,000 in 2015. At local elections in May the Conservatives won a greater vote share here than the SNP. If the swing seen then is repeated, Robertson would lose his seat. 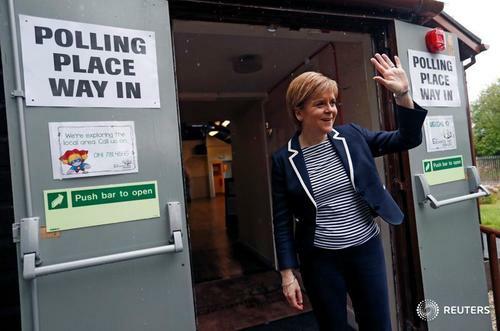 Moray, which voted in favour of Scotland remaining in the United Kingdom in 2014, was the closest Brexit result in Scotland, with "Remain" just 122 votes ahead of "Leave". This seat in Brexit-supporting Wales is held by Labour with a majority of 1,831 and has never been won by the Conservatives. 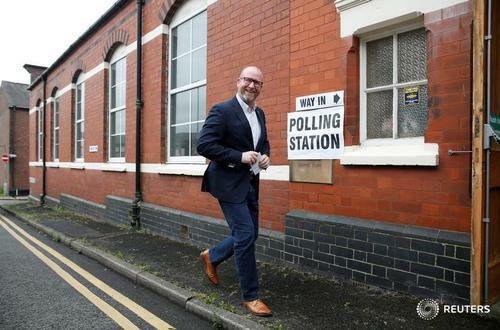 UKIP, which won more than 5,000 votes here in 2015, is not fielding a candidate this time and Curtice points to it as one to watch for signs that May could substantially increase her majority nationally. 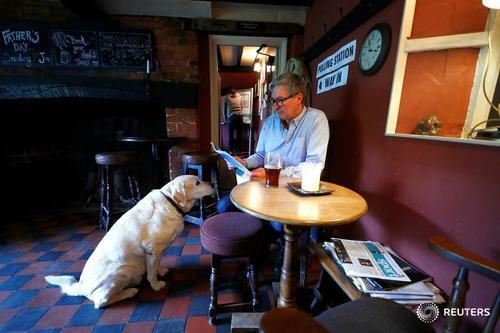 This is the seat of interior minister Amber Rudd, who has played a prominent role in the election campaign and is tipped as a possible successor to Chancellor Philip Hammond. She has held it since 2010, and won a majority of 4,796 in 2015. 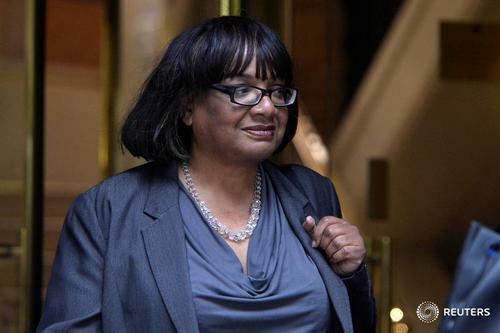 The Green Party, which won just under 2,000 votes there in 2015, has agreed not to field a candidate in a bid to help Labour try and unseat Rudd. 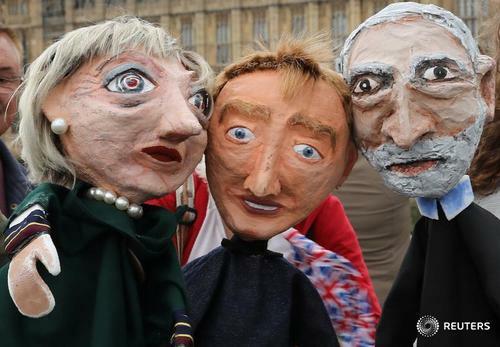 Pollster YouGov's election model has predicted they could succeed in doing so. This seat is being targeted by the pro-EU Liberal Democrats, who lost it to the Conservatives in 2015. 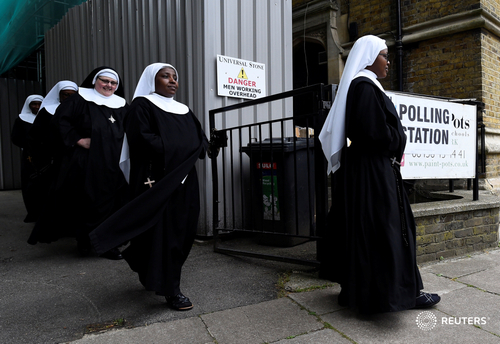 The area voted strongly to remain in the EU at last year's referendum. 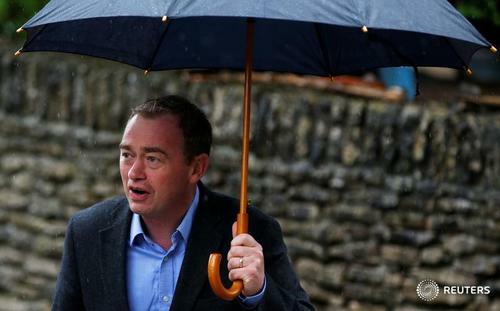 Whether the Liberal Democrats are able to overturn the Conservatives' majority of 2,834 will be a key test of how far remain supporters are willing to back May's Brexit plan. The seat of Liberal Democrat leader Tim Farron. 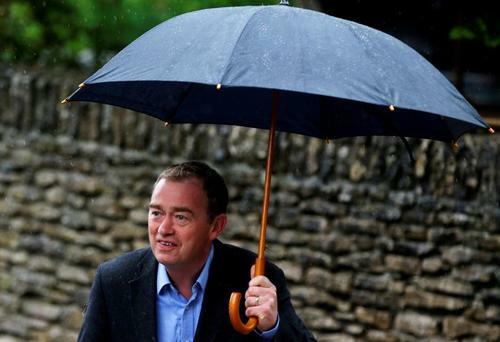 He won it with a majority of nearly 9,000 votes in 2015 but his party's expected surge in support due to its anti-Brexit stance has failed to materialise. Cumbria, where the seat sits, voted in favour of Brexit and the Conservatives are hoping to oust Farron. They are likely to be helped by the fact UKIP, which got just over 3,000 votes there in 2015, are not standing. This marginal seat is held by the Conservative minister responsible for financial services, Simon Kirby, with a majority of just 690. 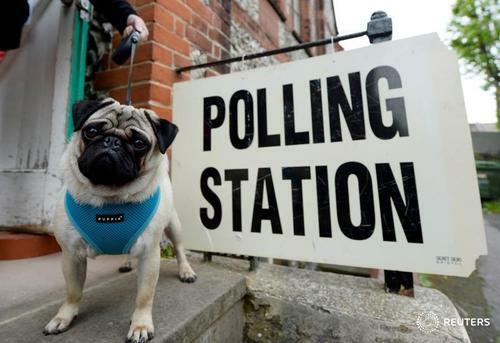 It voted strongly in favour of remaining in the EU. 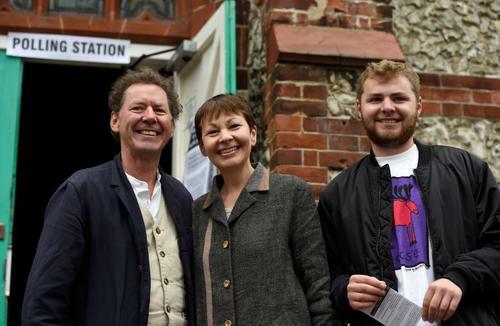 It has been a bellwether at national elections since 1979 and the Green Party, who won more than 3,000 votes here in 2015, are not standing. Labour need to win seats like this if they are to have any chance of being the largest party nationally. 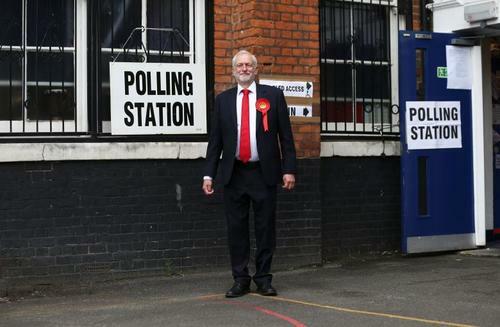 This is one of Labour's most marginal seats, with a majority of just 428. 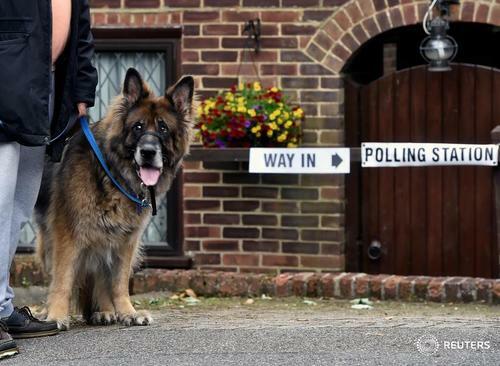 It voted in favour of Brexit. May's Conservatives launched their election policy document here and need to win seats like this if she is to win a comfortable majority.